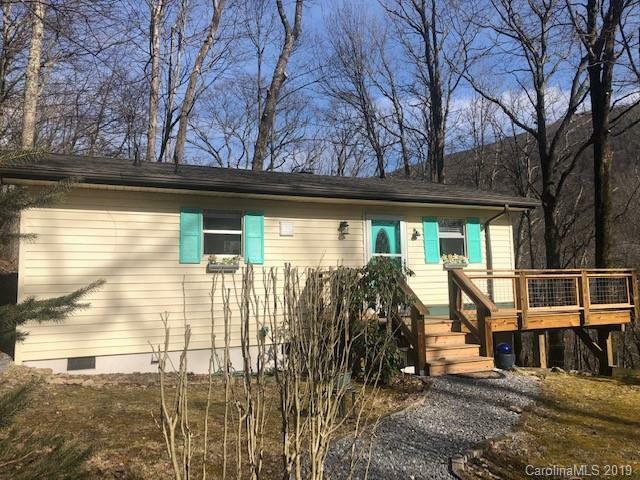 Great little two bedroom mountain cottage just off the Blue Ridge Pkwy in Maggie Valley at 4300' elevation. Small but packs a quality punch. Turn-key including quality furniture and decor, linens, towels, kitchen equipment, firewood, propane, outdoor tools. New appliances/washer/dryer, new granite sink, new butcher block counter-tops; tiled bath and shower; warm cork floors in kitchen and living area, wood veneer in bedrooms; new lighting, new sliders, new interior doors; New Rinnai on-demand propane water heater, new Rinnai propane wall furnace; cast iron woodburning stove. Newly insulated crawlspace, new vapor barrier, new 30-year architectural shingled roof; brand new, stylish, wraparound deck. Easy winter access a short way off state maintained 19 on a no-outlet road. Great area for ATVs and walking and running; 12 miles to Harrahs Cherokee and very close to premier hiking in the National Park and local waterfalls. Minutes into Maggie Valley, 30 minutes to Asheville.